Be Well mini magazine — RandallAnthony Communications Inc. 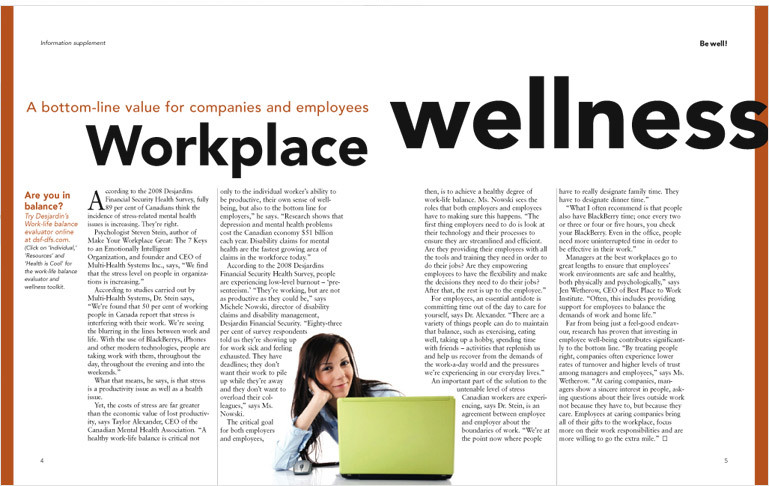 Produced for Desjardins Financial Security on behalf of The Globe and Mail’s Custom Content Group, Be Wellmini-magazine addressed issues concerning workplace wellness, with an emphasis on mental health. Editorially, this compact magazine conveyed integrity through interviews with experts including Dr. Steven Stein, author of Make Your Workplace Great: The 7 Keys to an Emotionally Intelligent Organization, Jen Wetherow of The Great Place to Work Institute, Taylor Alexander of Canadian Mental Health Association and others. Desjardin’s brand alignment with this magazine’s content and subject manner was conveyed through the incorporation of branding elements, display advertising and editorial comments from Michele Nowski, Desjardins Financial Security’s director of disability claims and disability management. Be Well mini-magazine achieved broad distribution through Report on Business magazine as well as through Desjardins Financial Security offices across Canada.